The maximum cash out from this bonus is 5x the bonus amount, AU$25. Deposit #2 - 100% match with a max value of $200 and 20 Free Spins. Deposit #3 - 100% match with a max value of $200 and 20 Free Spins. Deposit #4 - 100% match with a max value of $200 and 20 Free Spins. Deposit #5 - 100% match with a max value of $200 and 20 Free Spins. If you're looking for an Australian casino that caters to everyone in the market, then you'd be hard-pressed to find many better than Fair Go Casino. The site offers a vast portfolio of both pokies and table games, and caters well to mobile users with a fully responsive site. Fair Go Casino also offers a fair amount of bonuses and promotions to its users and free spins seems to be the talk of the town as you're likely to get free spins on many different promotions with minimal deposits. 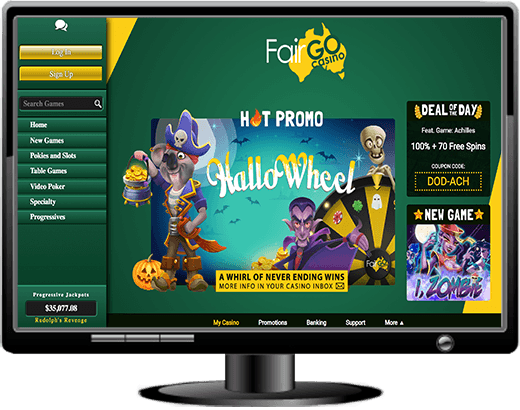 As soon as you hit the homepage, you'll be presented with the Fair Go Casino login where you have limited functionality, urging you to sign in. The site is easy to look at and one could say that it caters to the Australian market by having green and yellow primary colours, a top down view of the continent and a koala carrying a chip. It also has a rolling ticker showing the most recent winners and a deal of the day that changes as time goes on. 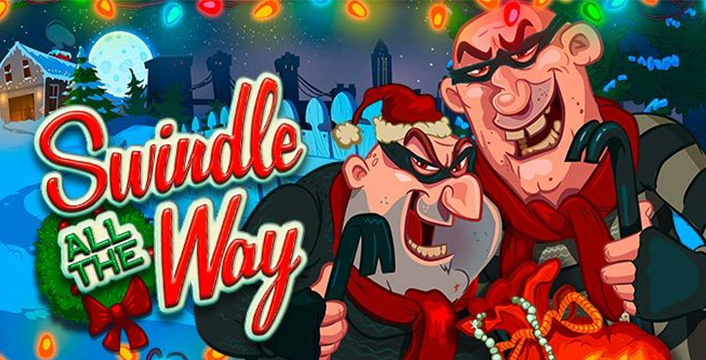 Get jolly this holiday and win free spins and bonuses on Swindle All the Way! This is a holiday-inspired RTG pokie that features as FairGo Casino’s Game of the Month in November. Get Your Car Washed for a 3rd Time and Pick up Great Rewards as you Do! Get your car washed at Fair Go Casino Now and reap the rewards of their saucy brand new slot! Fair Go Casino is backed by Real Time Gaming software which means that you'll have full and unfettered access to all the games offered in the RTG portfolio. By just signing up, you'll get access to a bunch of pokies, from anywhere between 3 and 6 reel machines, including bonus round pokies and some progressive jackpot slots. You'll get to play on their 50+ video poker games, including the likes of 1-hand, 3-hand and 10-hand, but you'll also be able to play 15 table games where you'll get your blackjack and roulette fix. Fair Go Casino also has specialty games including scratch cards, bingo, keno and a couple more which aren't necessarily categorised. If you're in the market for a new variety of pokies, want to play some table games or merely just want to spin a few times on the biggest progressive jackpots to try and become an instant millionaire, you'll see that Fair Go Casino has everything that a gambler could want in an online casino and features a number of bonuses and promotions to help you along your way. Aladdin's Wishes, Triple Twister, Super 6, Naughty Or Nice and Asgard are just some of the top games you can experience here. As is usually the case, many casinos these days love to cater to a mobile audience that plays games on the go. Fair Go Casino is definitely no different. You'll find that as soon as you log on to the Fair Go casino mobile site, no matter your device, you'll be met with a fresh and responsive mobile site with everything at your fingertips. RTG is a software provider that understands mobile gaming and as a result, generally tends to make their best and most popular games available on mobile. They also ensure that they don't needlessly use additional bandwidth that they don't need to and doesn't make your mobile device slower by using excess memory. Fair Go Casino also offers some exclusive mobile bonus codes and coupons so they really want you to play on your mobile. You'll be able to get a 50% match bonus worth up to $200 and if the deposit is made between Monday and Thursday, you'll get an extra 30 free spins. Perhaps one of the greatest features that sets this casino apart from the others is that everything you need on the site is on one page. It's super simple and very easy to get access to whatever you want to do on your mobile. The site has instant play games and there is no download software or anything that might bog your phone down or get in the way of you playing games. Whether you're running the latest and greatest Android phones or even the newest iPhone, you shouldn't have any issues with playing at Fair Go. Our review team tried out the Fair Go mobile responsive lobby on early model phones too and the consensus seems to be anything newer than an iPhone 3 or any Android version about 3.5. With the backing and support of RTG, there are plenty of different progressive jackpots that you're able to play at Fair Go Casino. You'll be able to try the Megasaur or Spirit of the Inca pokies where you can become an instant millionaire. You'll also be able to try games like Caribbean Hold'em Poker, Caribbean Stud Poker and Let Em Ride progressive jackpots. As we've already mentioned, there is a bonus that is exclusive to mobile users, but apart from that Fair Go Casino offers a $1,000 welcome bonus, which is a 100% match bonus of $200 redeemable five times. You can also claim a Bonus to Go where you'll be able to get 50% matched up to $200 which is available daily. If you're a player who has been around at Fair Go Casino for a while, the 25% cashback scheme will allow you to claim money back on every busted deposit of $10 or more when playing without a deposit. On the weekend, a 30% cashback bonus will apply. Aside from these two promotions, Fair Go Casino has a bunch of other promotions that are available to claim almost every day of the week. With those and the fantastic loyalty program, there seems to be no stopping Fair Go on catering to every player online. 40-FAIRIES Grab a 75% bonus and 40 free spins. 200-NEO Deposit with Neosurf and get 200% up to $1000 bonus. KOALAMOBonus valid all day long giving you more in bonuses for the more you deposit. WEALTHY30Deposit at least once from Monday to Thursday and get 30 free God of Wealth spins. With Fair Go Casino, you'll be able to get hold of customer support 24/7. Not only is there a live chat service, but if you're local in Australia, you'll get access to a toll free phone number. You can also contact Fair Go through email, and if you're playing outside of Australia, then you can contact them on the international phone number. When contacting via email, you'll need to give a few days' notice. However, the live chat is very responsive and you'll be able to get your problems sorted out in a jiffy. You'll be given a fair amount of banking options with Fair Go Casino but they generally tend to be more accepting of newer payment methods. You can make deposits visa MasterCard and VISA, but will only be able to withdraw on each through BankWire. You can also deposit using Neosurf, a pre-paid card that seems to be quite popular. Cryptocurrency is alive and well within Fair Go Casino where you can both deposit and withdraw with Bitcoin. Bank Transfer can also be used for withdrawals, so in terms of getting your winnings out, Fair Go can perhaps be a little limiting. It's always a good idea to check how long withdrawal speeds are going to be for each and every payment method. Fair Go needs anywhere between 48 and 72 hours to process payments on their side, and from there, you'll need to wait a bit. Usually bank transfers will take anywhere between 3 and 7 days to process where as if you were to withdraw in Bitcoin, it will take only as long as it needs to for the ledger to process, which means you should get it in a few mere hours. We like Fair Go Casino for its simplicity and for the way it caters to everyone. There are a lot of games on offer and the site is really fun to use and play at. Whether you're on desktop or mobile, you'll still find that Fair Go is a great site to use. We felt that perhaps the casino lacked some deposit and withdrawal options but there isn't really much more to it than that. It's a great site for Australians to play and have a great time doing so.